Byculla is a neighbourhood in South Mumbai. It is also the name of a railway station on the Mumbai suburban railway on the Central Railway line. Haji Ismail Gani building in Byculla in 2002. Sandhurst Road and Bhendi Bazaar to the South. Byculla falls under "E" Ward within the municipal limits of Brihanmumbai Municipal Corporation or BMC. The Byculla railway station was completed by 1857. This was also the time the first mills came into this area, until then, used only for residential purposes. Byculla used to house many of the city's textile mills until the mills shut shop and moved out of the island city. As of today, few mills are operational and even they are on the brink of closure. Many of these old mills are now desolate and some are being razed down to make way for newer constructions. The Khatau Mills were situated in Byculla, in the news for the alleged murder of the owner Sunit Khatau in May, 1994. Byculla saw some horrible Riots during 1936-37 rose during Temple-Mosque dispute.. Today, Byculla is an upper-middle class enclave with a mixture of different societies like Marathi, Gujarati, Christian, Muslims, Jains etc. Traditionally, Byculla has been inhabited by Parsis, Christians, Jews, Hindus and Muslims. Byculla, like many other locations of Mumbai have witnessed strong real estate growth, particularly in the Motisha Lane area where there are lots of tall residential buildings, occupied by affluent Jain community. Of late, Byculla has also witnessed the increase of population of Dawoodi Bohra and other traditional Muslims, who are primarily a business community like most of the Gujaratis. There is also a BIT Chawl, primarily housing Marathi working class community, home to one of the largest Ganesha idols during the Ganeshotsav celebrations. Zoo: Byculla houses the city zoo called Jijamata Udyaan or Rani Baug (earlier called Victoria Gardens). There are talks of shifting the zoo to a more spacious location. Museum: Byculla also houses the Bhau Daji Lad Museum (earlier Victoria and Albert Museum). It was built in 1871 and is a near replica of its namesake in London. It reopened 5 January 2008, following extensive renovations. National Railway Hospital: Byculla also possesses the biggest National Railway Hospital called "Dr. Babasaheb Ambedkar Railway Hospital" in front of Veer Jijamata Prani Sangrahalaya. Vegetable Market: The Byculla Vegetable Market is the largest vegetable market in Mumbai (even larger than Crawford Market). Fly-overs and bridges: Byculla is also known for Mumbai's first ever Y shaped bridge built across Dr. Babasaheb Ambedkar Road which then splits further to go to Byculla East and West before the Clare Road intersection, thereby forming a Y shape when seen from the air. This was one of the oldest fly-overs built in Mumbai. Fire Brigade Headquarters: Mumbai Fire Brigade's headquarters are situated just below the "Y Bridge". In the front of the Headquarters building stands a memorial built in the memory of the numerous fire fighters who died during the Bombay Explosion of April, 1944. Mustafa bazaar: A wholesale timber market is frequently visited by many from the city. Jerbai Baug and Rustom Baug: are the two Parsi colonies where most of the Parsis of Byculla live. Seva Niketan: A solar-powered Jesuit-run men's hostel that has served as headquarters for various NGOs. Mazagaon: A residential locality close to byculla which has a famous hospital named "Prince Aly Khan Hospital". Orphanage: Ashadaan is an old age home and a home for specially abled kids. Jain Temple: Byculla is also known for the famous Jain Temple, Motisha Jain Derasar. This Jain temple is situated in Love Lane, which has now been renamed as Motisha Lane. St. Anne's Church: Byculla is also home to St. Anne's Church in Mazagon. The present structure of St Anne’s Church was erected in 1881 on top of the foundation of the small chapel that was originally built in 1787. The original chapel was erected by an Armenian woman called Rose Nesbit. The land on which the chapel (and now St Anne’s Church) was built was her farmland, on the Island of Mazagon where she lived with her parents. Gloria Church: Byculla also houses Gloria Church, the church frequented by most local Christians. The Church shares a common playing ground with Antonio D'Souza High School which was built in 1825. Magen David Synagogue: is believed to be one of the oldest ones in the city. David Sassoon, a Baghdadi Jew, built the Magen David Synagogue in 1861 in Byculla, where the family first lived. Like most other localities of Mumbai, Byculla also is home to a number of small Hindu temples and Muslim Mosques located in its small pockets. Byculla is very well connected by Central Railway line of the Mumbai Suburban Railway, as well as Bus routes serviced by BEST. Most of the bus routes servicing South Mumbai, South-Central Mumbai, Central Mumbai and North-East Mumbai pass through Byculla. The resulting heavy traffic prompted city planners to develop major fly-overs in Byculla, as early as the 1980s. Almost all local trains halt at Byculla railway station. 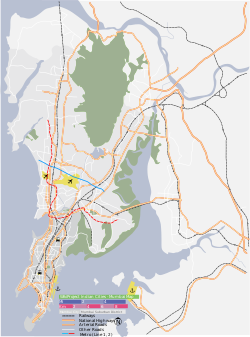 Mumbai Central and Mahalakshmi on the Western Railway line and Dockyard Road and Reay Road stations on the Harbour Line of Mumbai Suburban Railway also lie close to Byculla. Ferry Wharf, a major ferry servicing port is located at a small distance from Byculla, in the Dockyard Road locality. The Y-Bridge fly-over was filmed in the famous Hindi comedy-satire film called Jaane Bhi Do Yaaron where the famous coffin scene between inebriated Om Puri and the dead-body of Satish Shah takes place. The fly-over is also shown being inaugurated at the beginning of the film. The famous "S-Bridge" of Byculla is one of its kind of flyover in Mumbai, Officially called "Gardens Bridge", the stone masonry bridge connects East Byculla to West Byculla. It was built in 1913 by Seth Teju Kaya, a registered railway contractor. The bridge was built in a creative manner. Gloria Church has been filmed in many Hindi movies, including Amar Akbar Anthony. Byculla Boy is the name of a novel written by eminent author Ashok Banker, on the place where he and his mother grew up. Byculla to Bangkok, a book about organised crime and terror in Mumbai by S. Hussain Zaidi was published in 2014. ^ "Byculla (Bycullah): Mumbai/Bombay pages". TIFR. Retrieved 19 April 2014. ^ Samuel T. Sheppard (1916). The Byculla Club, 1833-1916, a history. Bombay Bennet, Coleman. Should zoo shift to Goregaon?